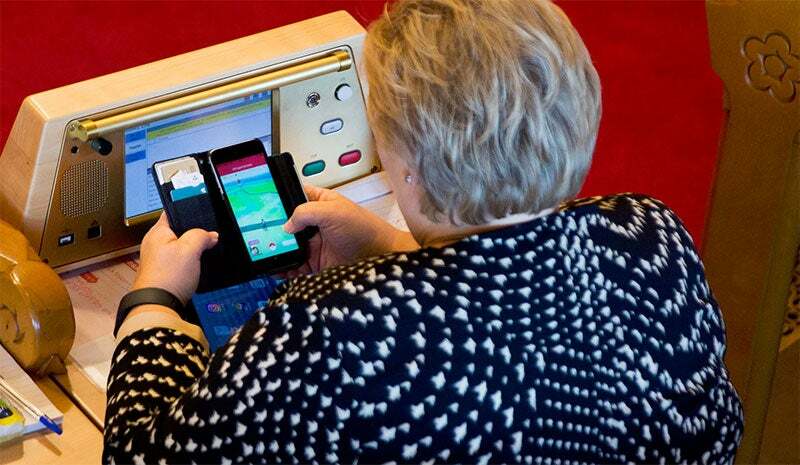 Erna Solberg, the leader of Norway's conservative party and Prime Minister of the country, was snapped by The Guardian on Tuesday playing Pokemon GO while in parliament. As they point out, she's not even the first Norwegian politician to be caught doing so, with liberal party leader Trine Skei Grande spotted doing the same thing in August. Please note this isn't a controversy: Solberg was playing during a speech by none other than Grande, the latter responding by saying, "we ladies can do two things at the same time you know." Which, whatever. My only concern here is: How do I get one of those Star Trek desks she's sitting at? She's never going to take down that snorlax gym while she doesn't have a gps signal.